K&J Magnetics now offers Magnet Wire! To celebrate the new arrival, we’re using some magnet wire to make a simple electromagnet. You might have seen this in elementary school as the classic demonstration of a length of wire wrapped around a nail. A battery provides an electric current and the nail temporarily becomes a magnet. In this article, K&J explores what’s going on. 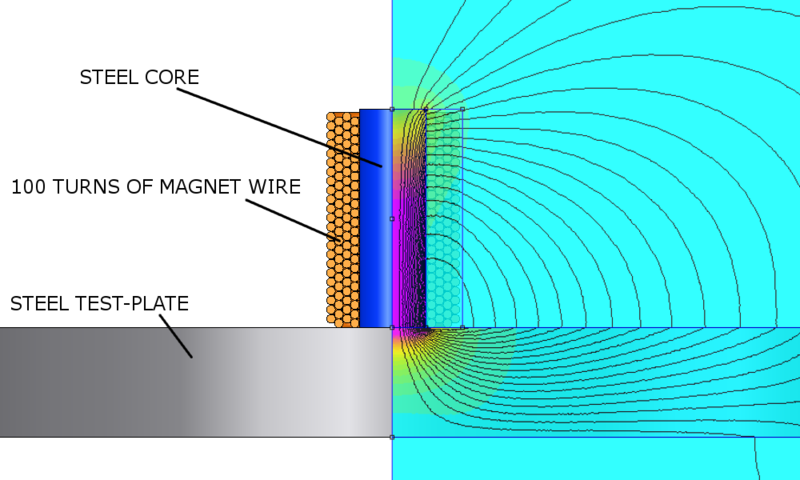 We’ll also briefly mention why this simple example gets to the core of what magnet wire is used for in so many things. A permanent magnet and an electromagnet look the same, from a distance. In the earliest days of figuring out electromagnetism, people like André-Marie Ampère and Hans Christian Ørsted learned that a current of electricity running through a wire creates a magnetic field around it. If you read about this history, there’s a lot of talk about current going through a straight length of wire, and how the magnetic field made a compass needle move. In making an electromagnet, we’re going to consider a coil of wire wrapped around a steel shaft rather than a straight length of wire, but the idea is the same: From the outside, while current is flowing through the coil of wire, the result looks like a magnet. Theoretically, you could have a permanent magnet and an electromagnet that produce a similar magnetic field. Measuring from a short distance away, you wouldn’t be able to tell them apart. 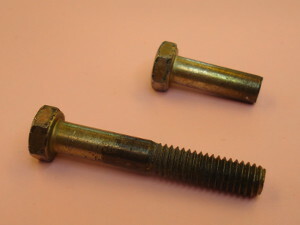 A 2" long bolt, and one cut down to a 1" length. We’re using a 1” long piece of a steel bolt as the core to wind the wire around. While the coil of wire would make a magnetic field without the steel core, it wouldn’t be nearly as strong. The ferromagnetic steel material helps to “concentrate” the magnetic field where we need it. Note: We used an old bolt from a pile of random hardware, but this might not have been the best material choice. The grade-5 bolt we used isn’t necessarily the best type of steel for the job. In hindsight, we might have had stronger results with a better choice of steel. 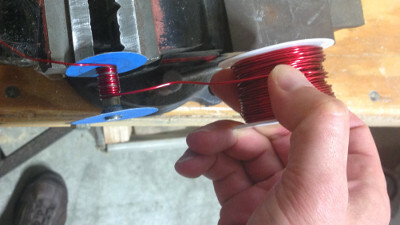 In the example shown here, we’ve wrapped the bolt with 100 turns of 18 gauge Magnet Wire, from a reel of MW18-4. Then we tried 200 turns to see how that compared. As you add wire, more turns of wire gives us more strength. It’s a case of diminishing returns, though, because additional turns are farther and farther away from our steel core. To keep things simple and safe, we used a single, AA size, 1.5 volt battery to supply the electricity. Other sources might provide more power, but this simple solution is available everywhere, easy to reproduce and inexpensive. It’s also a lot safer than various power supplies you might plug into the wall. For a project that’s often recreated for kids / students, let’s avoid any serious electrocution! Be careful playing with electricity. What is Magnet Wire, anyway? Why would I want this kind of wire? Stranded HookUp Wire vs. 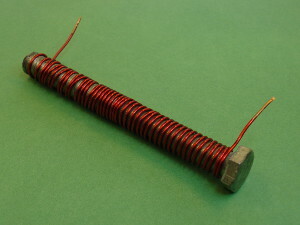 Magnet Wire. Note how much thicker the (blue) insulation is on the stranded wire! A look inside the power supply of a desktop PC. The input is AC alternating current, and it outputs 12V and 5V DC current. 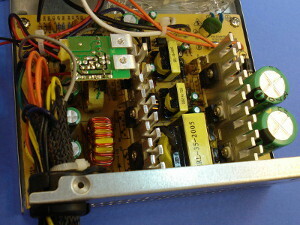 Note the many toroids and transformers, wrapped in Magnet Wire. Magnet wire is not a magnet. It’s not made from neodymium, nor does it stick to the fridge. Magnet wire doesn’t stick to steel. It’s a special kind of copper wire that has a very thin layer of insulation. Do you have to use magnet wire to make an electromagnet? No, you could use just about any insulated wire. Why use magnet wire instead of regular hook-up wire? Magnet wire is used for things where you need electromagnets or electromagnet-like stuff. 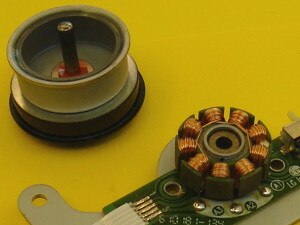 Look inside transformers, electric motors or hard drives, and you'll find that the windings of wire all use magnet wire. Why did they choose this? 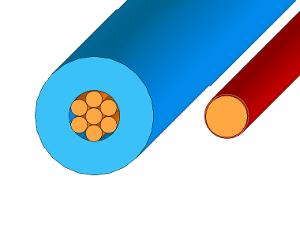 Regular wire has stranded copper wire, with multiple strands of thinner wire twisted together. It is wrapped with relatively thick insulation. Magnet wire is single core wire, and has a very thin insulating coating, more like varnish. The properties of regular wire are great for cables that move around. Think of the wire used on your headphones: it’s flexible and durable. The stranded copper wires inside are able to bend around without breaking the copper. The thicker insulation is tough and resists getting cut with normal wear, preventing electrical shorts. Magnet wire isn’t so good at those things. It is definitely not good wire to make headphones with! It’s not as flexible, and the insulation isn’t very thick. For magnetic applications like this electromagnet, however, you really want to get as much wire as close to the steel core as you can. If we use regular wire with thicker insulation, we’ll find that the outer layers are farther away from the core, and aren’t as effective. Since magnet wire tends to get wrapped in place once and then not moved around, the thinner insulation doesn’t need to be quite so durable. Thin insulation is OK here. In the video below, we show how this simple electromagnet acts like a magnet when current is flowing, and doesn’t when current is off. We also measure the field strength above it and the pull force it provides to a steel surface. Want a little more technical info about what’s going on? k = a constant, the magnetic permeability of the core material. Iron = 5000, Steel = 100, Air = 1. When we plug in the numbers for what we built, we find that the calculated field strength is a LOT higher than what we actually measured. Why is this so? Let’s ignore the fact that we measured the field strength at the end of the steel core, not inside it. The results disagree because this formula clearly oversimplifies the situation. For example, nowhere do you get to enter anything about the size of the wire, or how far away the outer sections of the coil are from the center. This must matter, but isn’t accounted for here. As an extreme example, consider what things would look like if we used wire with ¼” thick insulation. The windings would be huge, maybe a foot or more in diameter. This crazy example is definitely going to give us less magnetic strength, but there’s nowhere in this formula to account for it. Still, the formula a good starting point for understanding the basic relationships. You get a stronger magnetic field with better core material, more windings per inch and/or more current. To get a better picture of what the magnetic field looks like, we modeled it on the computer. 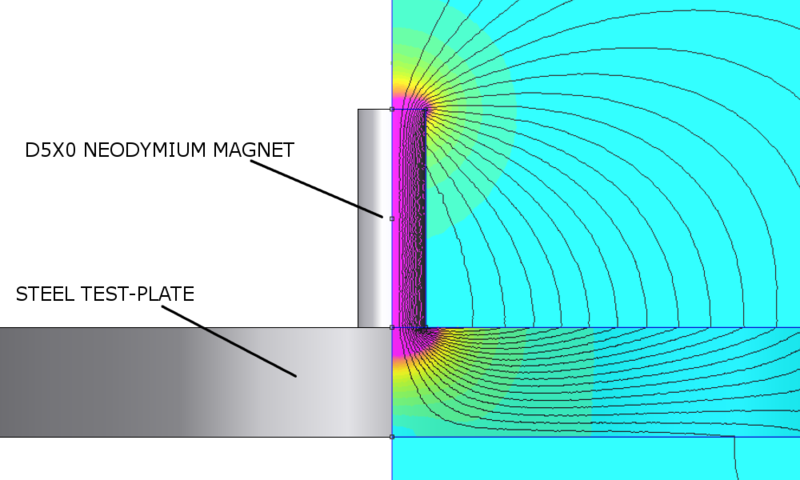 Finite element analysis gives us some idea of what the magnetic field’s strength and direction looks like. The electromagnet looks a lot like a magnet. The direction of the magnetic field “flows” from one pole to the other. Compared to the neodymium magnet, though, this electromagnet isn’t as strong. We measured both the pull force and the field strength of this simple electromagnet. Using our typical Pull Force, Case 1 method of pulling the (electro)magnet away from a thick steel plate, we measured about 1 lb of force. This was true for either 100 or 200 turns of wire around the bolt. While we expected the greater number of turns to provide more strength, they were about the same. The field strength just above the surface of the bolt end was about 295 Gauss for the 100-turn example, and 380 Gauss for the 200-turn setup. Is an electromagnet stronger than a neodymium magnet? It depends. There are many choices to make when designing an electromagnet, and each influences its strength. Size, number of turns of wire, wire gauge, current, core material, etc. – all of these things influence the strength. There’s no simple answer. What size electromagnet should I use to be equal to a specific neodymium magnet size? It depends. As with the last question, it depends on the details of the electromagnet’s design. Can an electromagnet repel a neodymium magnet? Yes. If the current is going in the proper direction so that like poles of the two magnets are facing each other, you’ll see repulsion forces. You might find situations where a neodymium magnet is more attracted to the steel core than the repelling force, especially when they get close. Do I need to use a coil of wire to re-magnetize old ceramic or Alnico Magnets? No. 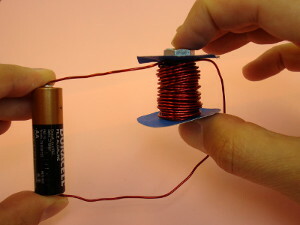 While you can find old instructions for re-magnetizing old magnets with a recharging device based on a coil of wire (like this electromagnet), you might not need this equipment today. Since neodymium magnets are so much stronger, you might be able to remagnetize your old magnets with some neo magnets. See Why are Magnets Shaped like Horseshoes for an example. Won't an electromagnet perform better with a neodymium magnet as the core? No, not necessarily. While neodymium magnets are great at being a magnet, they don't have a high relative permeability like steel or iron. That's the property that tends to redirect the electromagnet's field through the core. A neodymium magnet in there, even an un-magnetized one, might only be a little better than an air core. Why did we use so much wire? Can’t I use less? Many pictures we've seen use a LOT less wire. Usually, this works out to be a lot less powerful, because strength goes up with the number of windings. It also tends to run out the battery more, since you’re drawing so much current – essentially shorting the battery out with such a short piece of wire. Also note that, even with our longer length of wire, we’re drawing way more current than a typical battery is meant to provide. It’s great for a demonstration, but you’ll go through batteries very quickly if you actually tried doing useful work like this. AA batteries have performance charts that only go up to 0.5 A, while C and D batters go up to 1 A. Even at those levels, it says you’ll use up the battery really fast. In our examples, we’re drawing 3 or 4 Amps, which is really too much for the little battery. Be creative with Magnet Wire. Let us know what projects you're working on with it!